Sixteen-year-old Lia Milthorpe and her twin sister Alice have just become orphans, and, as Lia discovers, they have also become enemies. 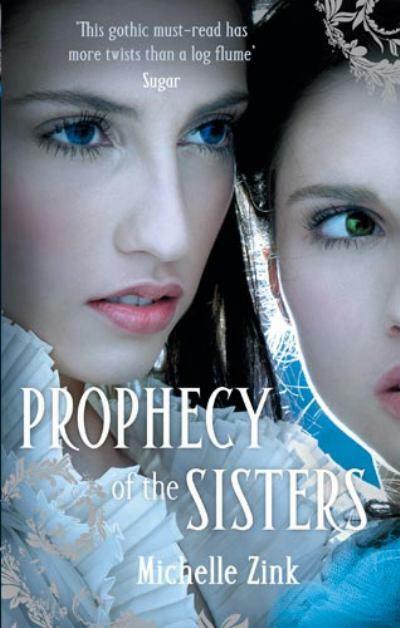 The twins are part of an ancient prophecy that has turned generations of sisters against each other. To escape from a dark fate and to remain in the arms of her beloved boyfriend James, Lia must end the prophecy before her sister does. Only then will she understand the mysterious circumstances of her parents' deaths, the true meaning of the strange mark branded on her wrist, and the lengths to which her sister will go to defeat her. Debut novelist Michelle Zink takes readers on an unforgettable journey where one sister's fateful decision could have an impact of Biblical proportions. 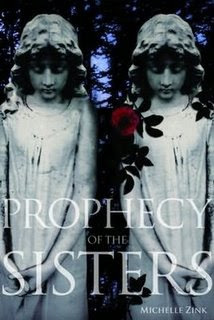 Prophecy of the Sisters is the first of three books. I enjoyed this dark, emotionally suspenseful debut. Those of you who know me know that I am very easily spooked by books about ghosts, spirits, the devil, and 'woo-woo' kind of things. Reading back over that sentence, I'm realizing that Prophecy of the Sisters contains all of those elements! It was because of this that I almost gave up on this book, but I'm glad I didn't. This book is told in the first person from Amalia's (who goes by Lia) point of view. Her twin Alice, whom she has always had a special bond with, is changing and exhibiting a dark side that scares Lia. Lia has an unusual mark on her wrist and the book starts with Lia trying to find out what the mark means. She soon uncovers a prophecy involving twin sisters, that she and her sister are unknowing parts of. Zink explores the battle between good and evil in all of us, as well as the difference in nature versus nurture. I really liked that focus of the story. This book is more of an emotional thriller than your typical an action-packed fighting novel. It was a bit of a slow starter but worth it in the end. Prophecy of the Sisters is set in Victorian New York---you know how much I like historical fiction so that aspect of the book really appealed to me. I enjoyed the book and am looking forward to the next one. If Guardian of the Gate gets any darker than Prophecy of the Sisters, though, I may be in trouble. People who like scary books will probably really enjoy this series. The new cover---I love this one! The aforementioned scariness. It almost did me in. I liked Lia's voice and the battle between good and evil. !!!!!!!!! it's scary?! oh well..
okay just in case it sounded like I think it's not scary at all.. I haven't read the book, and I already bought the 2nd book, which means I would have to buy the 1st book, and that would mean i would have to read them. and I'm easily scared............. sigh. It's hardly surprising that this book has a new cover, the original is super scary. I enjoyed this one as well though I do agree it started a bit slow. I also didn't understand the boyfriend's role, he seemed unnecessary but I'm guessing he'll come into play in book 2. I haven't read Guardian of the Gate yet but I'm looking forward to it. Really enjoyed your review! I really liked this book. I didn't think it was that scary though. ;) I got the second book on my tbr pile and hope to put a review up shortly. Victorian New York? Sounds goood! Great review.